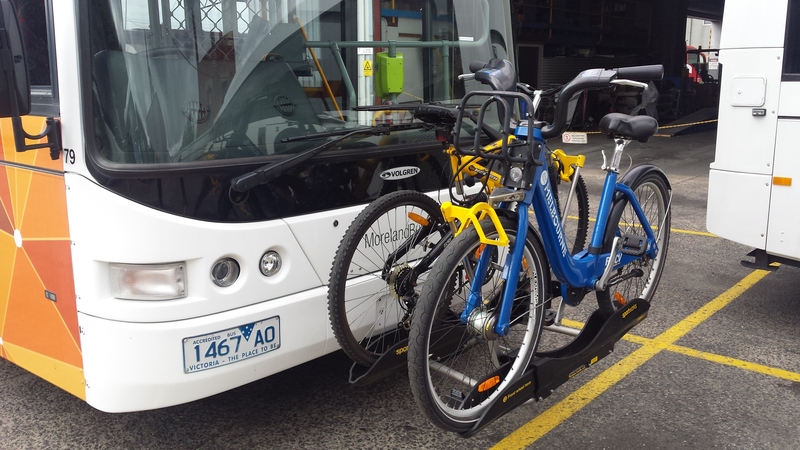 How to assist make the new and extended O’Keefe Rail Trail even better, ……even longer? The Friends of the Bendigo-Kilmore Rail Trail are keen to capture feedback from users of this great trail, whatever the comments might be! 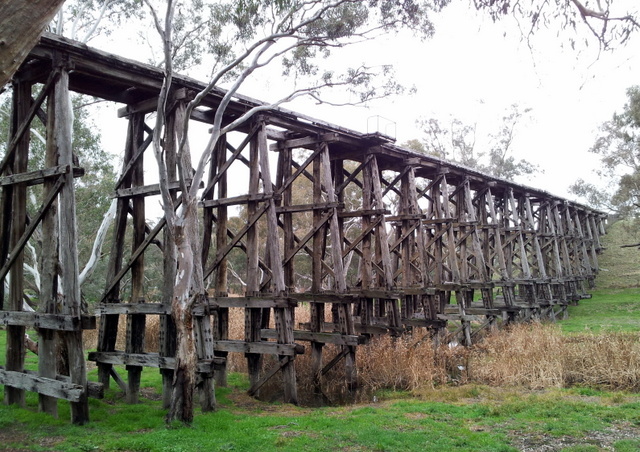 The City of Greater Bendigo Council, who is the manager of the O’Keefe Rail Trail, has assisted by creating a feedback form facility on-line. As the person providing the feedback, you are able to choose the amount of detail provided, and whether you would like a personal response. 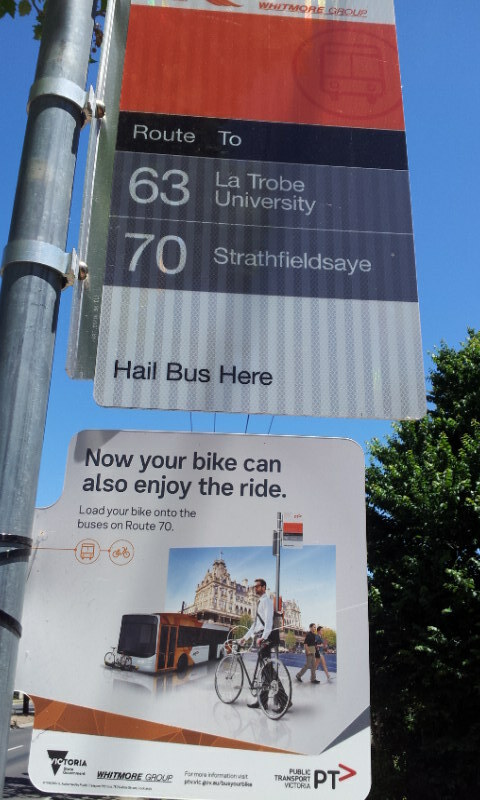 So please leave your comments about those O’Keefe Rail Trail experiences, and any suggestions, by completing the feedback form via this link, as your contribution to assist the trail’s future users. ABC Central Victoria Radio’s Breakfast program announcer, Jo Printz, interviewed Friends of the Bendigo-Kilmore Rail Trail’s President Garry Long on 11 August 2015. The topic was the O’Keefe Rail Trail and those ‘Creeks with No Names’! The group has this project that is seeking community input into the naming of certain waterways, which some of the trail’s seventeen bridges cross, as a number of these usually dry waterways appear not to be formally named. The interview can be listened to via this link. 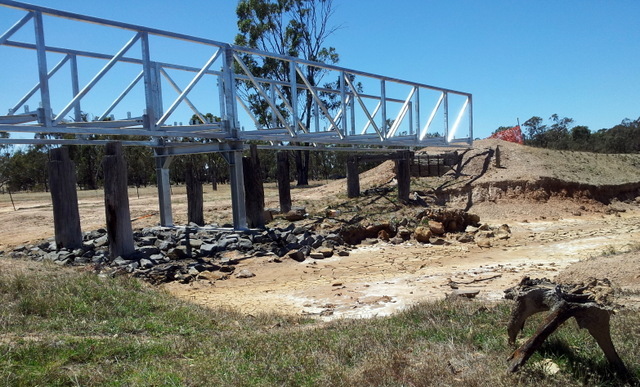 With the upgrading and extension of the O’Keefe Rail Trail has come fourteen (14) new trail bridges, making a total of seventeen (17) bridges crossing various waterways along the 50km trail. 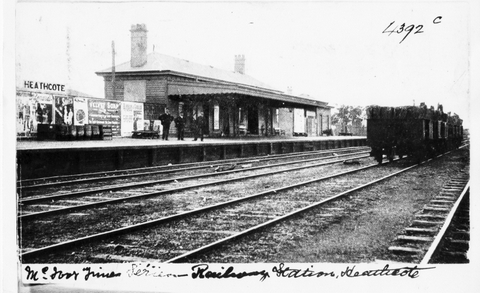 When the railway line was originally built in 1887-1888, there were initially 50 bridges constructed by Andrew O’Keefe’s company! Upon recent investigations, a number of these waterways crossed by the now 17 bridges appear not to be officially named in 2015. So why not put a recognised name to these waterways? Such would not only assist the trail manager, City of Greater Bendigo Council, to easily identify bridge assets or help with trail maintenance; naming could also assist emergency services and would also be a point of interest for trail users. 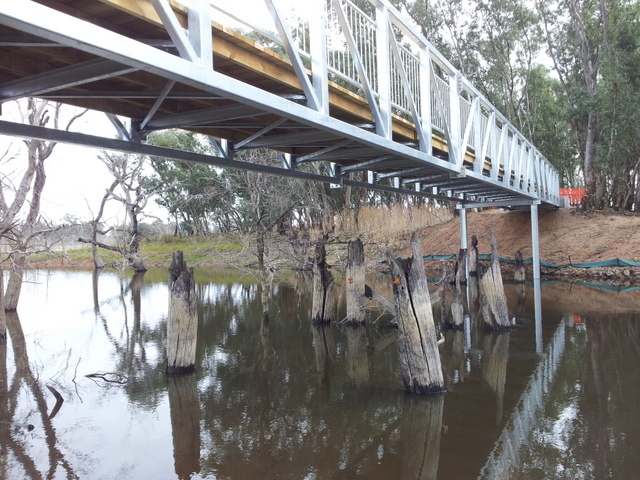 The Friends of the Bendigo-Kilmore Rail Trail have taken up this waterway naming challenge as a new project. Not only to seek out possible names that could related to historical links or natural environment-phenomena, yet also investigate a means to fund the manufacture and installation of naming signs at each waterway. Such donations may come from family connections, comapnies or individual donors. Suggested names will be submitted to the appropriate official land management authority for approval. Contributions, that included related information, are sort for the naming of these waterways. Such can be emailed to bendigokilmorerailtrail@gmail.com or PO Box 578 Bendigo 3552, before 31 August 2015. One by one, the missing historic railway marker posts (mile posts) are returning to the former Wandong (Wallan) to Bendigo Railway reserve. Most of the original concrete posts were removed when the recovery of the former railway infrastructure happened about 40 years ago, with only very few of the originals being left behind. The Friends of the Bendigo-Kilmore Rail Trail’s member Ken Hanson has been busy with a small yet expanding project over the past few years. Ken has produced replica concrete posts, each with individual cast numbers (numbered 73 to 100) and painted white with black numbers. Where to place them? Ken has measured the original ‘mile’ distances, so as to locate each post along the current and extending O’Keefe Rail Trail. Amazingly, Ken has sometimes even located the exact spot where the original post’s hole once was! Then, when the time was right, he has been ‘planting’ each of the new replica posts beside the rail trail. 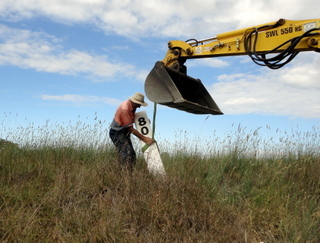 The latest one to be installed was the ‘80’ post, in the Derrinal area, yet mechanical help was needed to ‘plant’ this one into its new position. 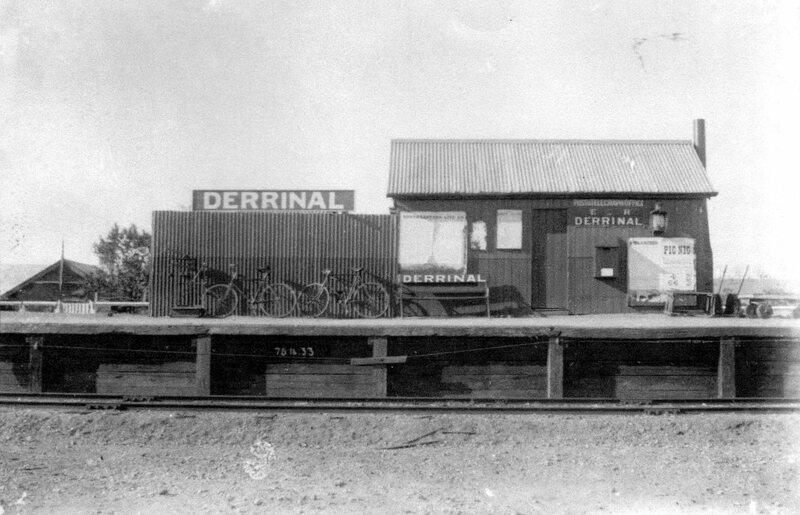 This is due to the post’s location being at an original railway cutting. Once the extending O’Keefe Rail Trail is completed in this section, the ’80 mile’ post will be there for all to see, thanks to Ken’s efforts! Dr Sue Beeton, the guru of rail trail research in Australia will be interviewed on ABC Central Vic (91.1 FM – or online) on Wednesday 4 April at around 8.50 am. If you can, tune in to hear what she has to say about the importance of research like this in backing arguments for developing and maintaining existing rail trails and establishing new trails.